Matthews fans are some of the most uniquely crafted fans in the industry. As one of the only ceiling fan companies that manufacturer and/or assemble parts of their products in the USA. They feature American-made heavy-duty ball bearing motors that deliver a powerful performance. Matthews products draw inspiration from the Brazil-based Gerbar Limited. Brazilian Matthews accessories start their life out in Brazil, where the fans' steel housings and skeleton are assembled before being shipped to the US. At the Matthews factory in Libertyville, Illinois, heavy-duty motors assemble these ceiling fans. Matthews Gerbar fans are then finished off with a powder-coating after being constructed out of stamped steel that is high-quality. The Matthews Irene fan is available in multiple configurations, motor finishes, blade tones, indoor and outdoor rated, with or without lights, and either three or five paddle blades. The most popular version is a three Walnut Tone blades, hugger outdoor ceiling fan with a column-shaped motor housing and an LED downlight. Three sizes are available in this style (42”, 52”, and 60”) and four different motor finishes (Textured Bronze, Chrome, Brushed Nickel, and Matte Black). The same configuration is available in a five-blade version with a Barn Wood Tone blade option. The Eliza was designed in 2013 by a Chicago architect who seamlessly blended beautiful modern form with superior function and movement. The blades were designed to maximize air movement at the outer edge of the blade to result in more efficient air velocity rings and greater motor optimization. The Eliza comes available in two different finishes and five different blade colors. This remarkable fixture also comes with a six-speed fan remote, dimmable lights, and reversable direction fan blades. The Matthews Dagny is a dual rotational ceiling fan which offers a unique design and a great airflow. The Dagny is UL and ULC damp rated and was designed with cast aluminum and heavy stamped steel. 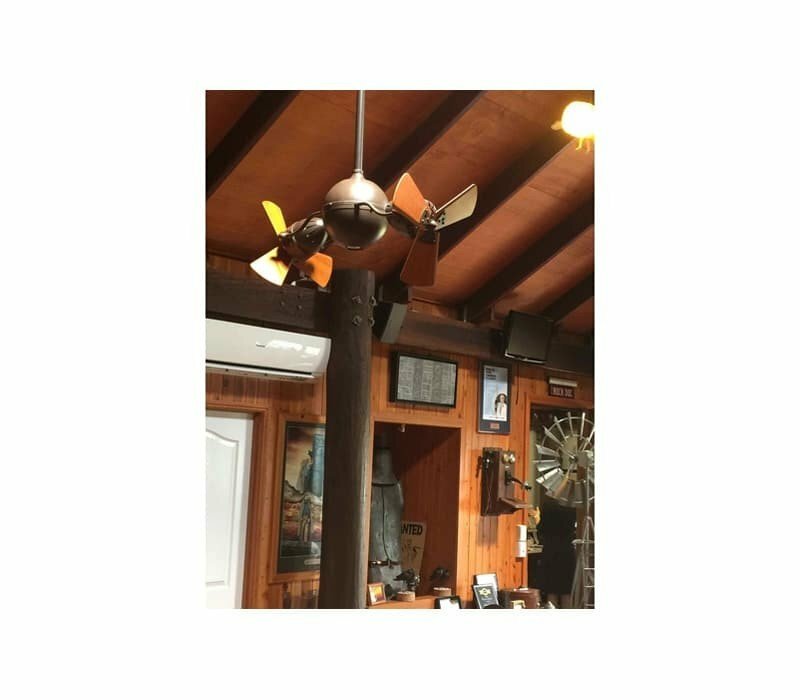 With a Textured Bronze finished and six solid mahogany wood blades, this ceiling fan showcases a design that is slightly reminiscent of twin outboards on the back of a sports fishing boat. The exposed assembly and adjustable fan heads are also very industrial in their composition. Lastly, let’s be honest, the dual ceiling fan design is just plain cool! Matthews ceiling fans create the wind draft you need to circulate the air in your bedroom, living room, kitchen, and your outdoor porch or patio. Matthews Fan Company fixtures are created to match any existing decor whether you need a Chrome or Copper finish. Matthews even offers fan options which mount flush to your wall if your ceiling is too low for a hugger fan. Matthews Fan Company fixtures are manufactured with your needs in mind, making sure your style and airflow issues are solved. Some roofs are too short to have anything attached to it but don't be concerned. The Melody and other Matthews wall mount fans solve this problem by moving air from an oscillating head attached to a wall platform. Because there are so many types of modern accessories to choose from it may be difficult to choose the correct fan for you. Find out what size ceiling fan is right for you to narrow the search parameters for your home.